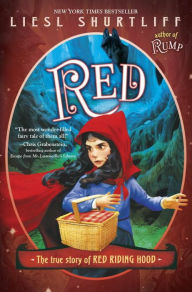 In this fun adventure story, Red goes on a journey to find a magical healing potion for her Granny, who’s sick. On the way, she unwillingly adopts a friend and fellow-traveler named Goldie, finds out the secrets of the Big Bad Wolf, and generally learns a lot of lessons about the value of life. This is a cute fairy tale retelling, appropriate for ages 8-12 years. It’s a bite-sized snack for those of us who gobble up fairy tale retellings – except this story is more like fairy tale fan-fic than an actual retelling. The plot is nothing like that of Little Red Riding Hood or of Goldilocks. It uses the characters and their basic personality traits to make a whole new story. This approach to the tale makes it refreshing because you really don’t know what’s going to happen next. This book is the third in Shurtliff’s fairy tale universe and apparently pick up where her book Rump leaves off. I haven’t read Jack or Rump, and I’d say this is pretty much a stand-alone book.